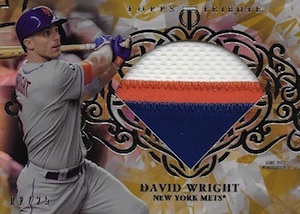 While 2015 Topps Tribute Baseball clearly did not go as planned, the recalled autograph cards were "inspected, treated, re-signed and slabbed" in a new premium release dubbed 2015 Topps Tribute Special Edition Baseball. 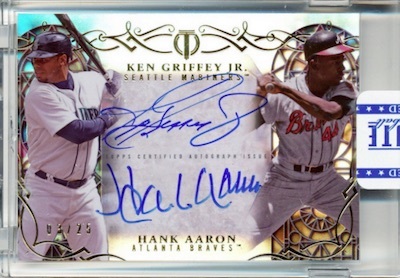 Issued in a special case-break format, hobby boxes yield 24 autographs and 30 memorabilia cards. Although obviously not the focus, base cards are still featured along with Green (#/99), Black (#/50), Purple (#/10), Red (1/1) and Printing Plate (1/1) parallels. The main signed set, Tribute Autographs showcase on-card signatures and added names like Kris Bryant and Carlos Correa. Parallels include Green (#/99), Orange (#/75), Black (#/50), Gold (#/25), Purple (#/10), Red (1/1), Onyx (1/1) and Printing Plates (1/1). Offering two signed inserts that combine to form the Then & Now set, Foundations of Greatness and Rightful Recognition Autographs are each numbered to 189. 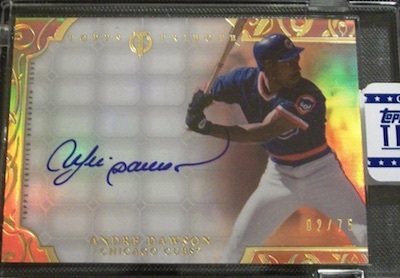 Black (#/50), Gold (#/25), Purple (#/10) and Red (1/1) parallels are also available. More limited choices include To the Victors Die-Cut Autographs (#'d) that drop one per box and also come as Gold (#/25), Purple (#/10) and Red (1/1) parallels. Eccentric Eye Black Autographs are also rare and include cards for Bryce Harper and Mike Trout, among others. The remainder of the product includes multiple relic cards. 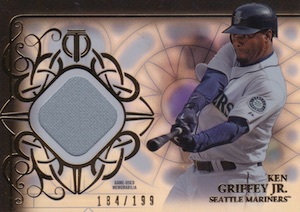 Tribute Relics are numbered to 199 and Diamond Cuts add a die-cut jumbo relic along with a print run of 199. Parallels include Green (#/150 - Only Tribute Relics), Orange (#/75), Black (#/50), Gold (#/25), Purple Patch (#/10), Red Patch (1/1),. 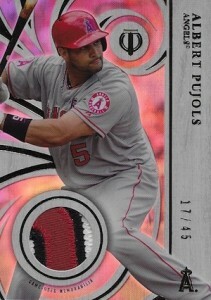 Offering more quality options, Prime Patches are numbered to 45 and include Purple (#/10) and Red (1/1) parallels. Milestone Relics feature a game-used relic from a notable moment. There is also a one-of-one Red Jumbo Autograph parallel. 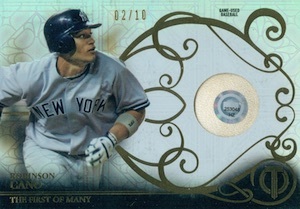 While regular boxes yield 30 memorabilia cards, random hot boxes include as many as 36 relics. Each pack includes four base or base parallel cards, two autographs and at least two relics. 100 cards. There are gaps in the checklist. 42 cards. Serial-numbered to 199. 25 cards. Serial-numbered to 189. 40 cards. Serial-numbered to 10. 35 cards. Serial-numbered to 45. 53 cards. Serial-numbered to 199. I spoke with my LHS owner who has ordered a case of the repackaged product. That case is 1 measly box. That “measly box” has a staggering 54 hits… but it will also set it’s prospective owner back an equally staggering $2,000. Yes, 2 grand. Good luck explaining that purchase to your wife! It looks like the missing cards in the base set are all players who have changed teams since the original release. 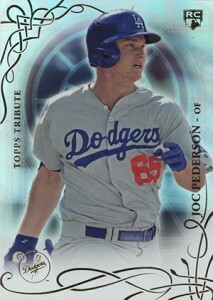 I guess Topps didn’t want to release cards in December of players who were traded several months ago. Since there are some of those cards out there from the first release that would make them short prints. Looks like Topps is trying to make back some of the money that they lost when this product was recalled, but we already knew that, and with 2016 right around the corner I ‘ll wait till then to buy that years cards before they get recalled too,just saying. Two reviewers gave a single star, without ever touching the product. Nice. Yes, the price is ridiculous. And yes, the rating should reflect the steep price. But to give it a single star just because it is too expensive for your blood? Come on! Yes, these cards are way out of my league as well. That doesn’t mean it deserves a single star. Based on the screen shots, the design is NICE! I really like the elegance, which gives it that super premium high-end look. I have seen some insane cases of this product, just absolutely loaded with big hits. At the same time I have seen some pretty mediocre cases. 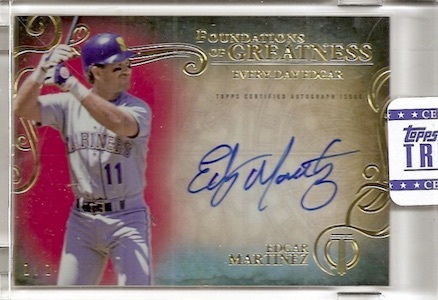 It’s no different from any other product on the market when it comes to hit or miss, but the majority of cases I have seen opened have been crazy good. So I broke down and bought a box. Got a great deal. End of year closeout from a company I have bought from for many years. I love everything about the set EXCEPT – I got 7 (SEVEN), count ’em – 7 Rusney Castillo autographs – It is almost as if Topps ran out of the ability to evenly distribute autographs so they dropped 7 of ’em into one very expensive box! Anyone out there have any experience like this with such a high-end product? I have not and hope you haven’t either – but if you got 7 of the same autograph in the same box – wouldn’t you be a bit curious about the QA and QC of the production and packing? Random? Plus – 2 autographs of Jorge Soler and 2 autographs of Ozzie Smith. So 11 autographs from 3 players. Anyone got advice? Purchased last month. Thanks and Happy New Year!